My personal philosophy is that we should just relax and chill out on the last long weekend of summer, but I’m willing to admit that the house does look better after a giant sort and toss. So I’m not too bothered by the forced labour on Labour day (I’m not even doing my fair share) but The Husband’s process is driving me batty. The Husband would go into both kids’ rooms and pull everything out all at once. Then, in mid-sort, he would decide our drawers should also be done and immediately pull every piece of clothing out of them. His mind might then turn to the utensil drawers and head down to clean those out, while all the clothes are still on the floors upstairs. Eventually all tasks will be completed, but it’s very chaotic. The plan was to devote the weekend to clearing out the basement in preparation for an upcoming reno. However, when I turned my back for a few moments this morning, everything had suddenly been pulled off the hooks and hauled out of the shelves in the back porch. So, in addition to our main floor still acting as the staging area for everything coming up out of the basement, the kitchen and dining room looked like ground zero of a bomb attack. I do not deny that the back porch was a disaster area. In addition to the outerwear, backpacks and sporting goods that get stored there, we also have baskets on the shelves in which we store the endless crap the kids bring home from school and day camp. We toss the majority as it comes into the house, but we do save a few things so that we don’t feel like terrible parents. Unfortunately, by the end of the year, those few things really add up. And since we haven’t done a good purge of the baskets in two years, there was a chance that the producers of Hoarders might show up. 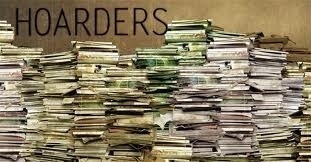 So, I agree that the basement is not the only place where we have been neglectful by not staying on top of the clutter… But do all things have to happen simultaneously? Even though there are still towers of storage bins lining the hall and recycling bags blocking safe passage from room to room, The Husband and I have come to an amiable truce (the treaty was signed over sushi). So, as I carefully make my way to bed, I will leave you with two pieces of priceless art that were uncovered today. 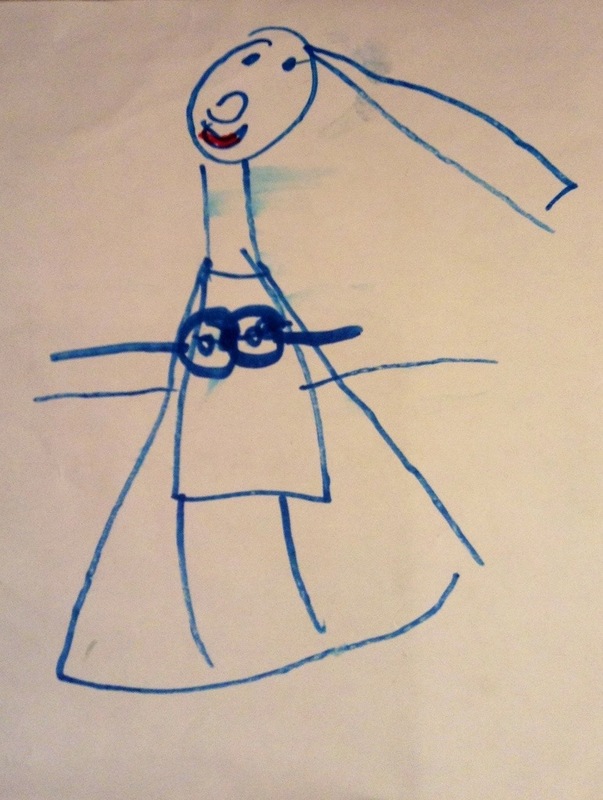 The first is by a 5-year-old ET and is entitled, Mommy In a Dress. Do you and your partner bang heads on any household chores? 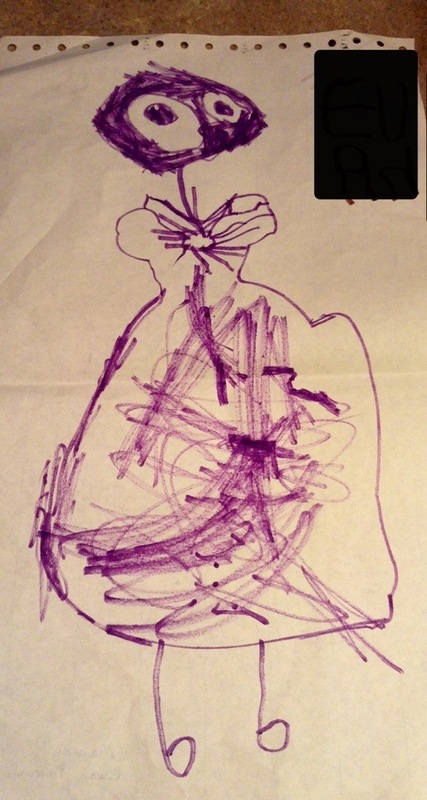 This entry was posted in Family and tagged Cleaning, clutter, drawing, Family, Hoarders, humor, humour, Husband, kids. Bookmark the permalink. EE, your children have great imagination. As for banging heads, no body to beat except the cats. P.S. Don’t let husband throw away these drawings, they are priceless. I fear it is only beginning… the reno is going to be hellish. Glad to hear you survived, gives me hope! Thanks for reading. I love that picture of you in your wedding dress! My husband and I do things very differently, so we don’t even try to collaborate on chores. Well, everyone needs a good giggle!